There is not a day that goes by when I am not wearing SPF. Yes even in the winter, even when it's cloudy and even when I am in the car. Since I am so fair, it's a necessity, but when I began blogging and learning about the damage that the sun can cause I increased my use from once in a while to daily. I know the skin still needs its Vitamin D so if I am going out in the sun for 10-15 minutes only or for a nice walk around the block then I probably won't put it on. But most of the time I am out all day long so it's necessary to protect my skin. I usually go for an SPF of 30 but increase it to 50 or even 60 when at the beach. The reason I never used to use a higher SPF during the day under my makeup was that most of the formulas years ago were so uncomfortable and greasy on the skin. I could tolerate it at the beach or pool, but on a daily basis - no way. Thankfully that is not the case anymore as brands have really stepped up their game when it comes to SPF formulations and now they feel more like moisturizers and less like an old school sunscreen. Typically I wear an SPF 30 during the winter months, but when the spring and summer come I like to step it up since I will be spending more time outside. And especially for a trip like we are currently on where we spend the majority of the day sightseeing, I reach for an SPF 50 or higher that I can wear under my makeup. I have recently come across three new formulas that were welcome additions to my routine. 1. Shiseido Ultimate Sun Protection Lotion Broad Spectrum SPF 50+ - I am already a huge fan of this sunscreen from Shiseido and use it as a makeup primer because of its incredible mattifying properties. 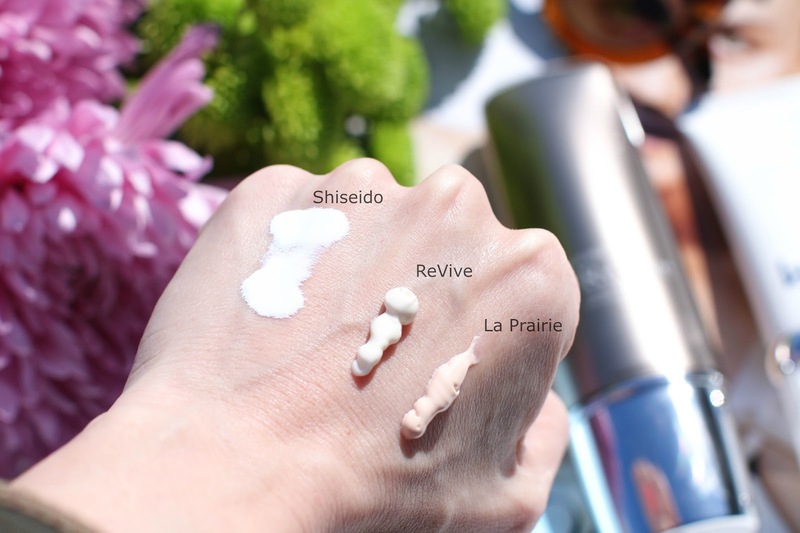 I will admit when I first felt this new one from Shiseido, my mind immediately went back to images of those old school runny, greasy sunscreens that I couldn't stand. And I actually put off trying this one until I had tested the other two. But knowing how well this one wore on my skin, I knew I should give it a shot. Thank goodness I did because it is gorgeous! It does have a more matte finish so I have been loving it under makeup, but it can have a slight whitish cast when first applied, though it disappears quickly once the product absorbs into the skin. What I love about this one is I can wear it for daily errands under makeup, but because of it's waterproof properties I can also bring it to the beach with me! 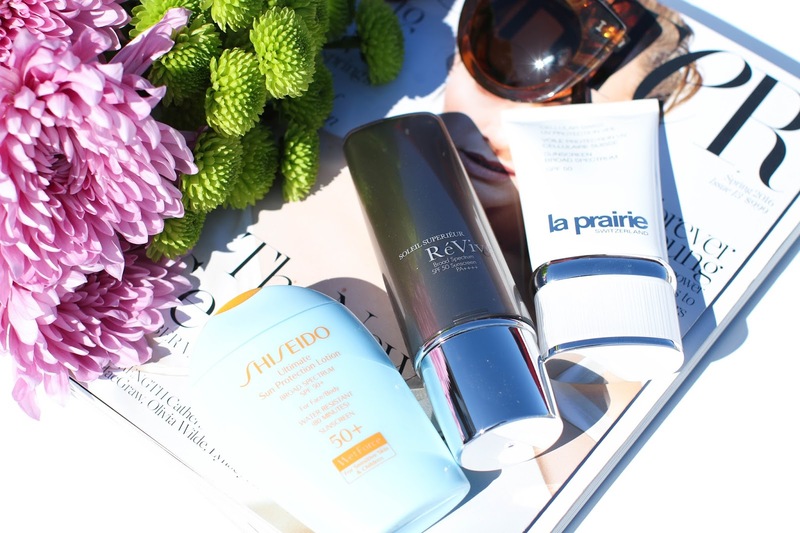 The perfect versatile sunscreen. 2. Revive Broad Spectrum SPF 50 Sunscreen - Immediately after swatching this on the back of my hand I knew I would love wearing this sunscreen. It has a creamy moisturizing feel to it that doesn't leave the skin feeling tacky. In fact, I wouldn't even know this was an SPF unless I saw the bottle - that is how wonderful the texture is on the skin. This gives a natural finish to the skin, though not as matte as the Shiseido. I don't find that it makes me shiny throughout the day so I enjoy wearing this in the warm weather, and will probably use it in the fall and winter as well because of its hydrating properties. In addition to the sun protection provided, it is formulated to help improve skin firmness and elasticity while still leaving the skin feeling well hydrated. 3. 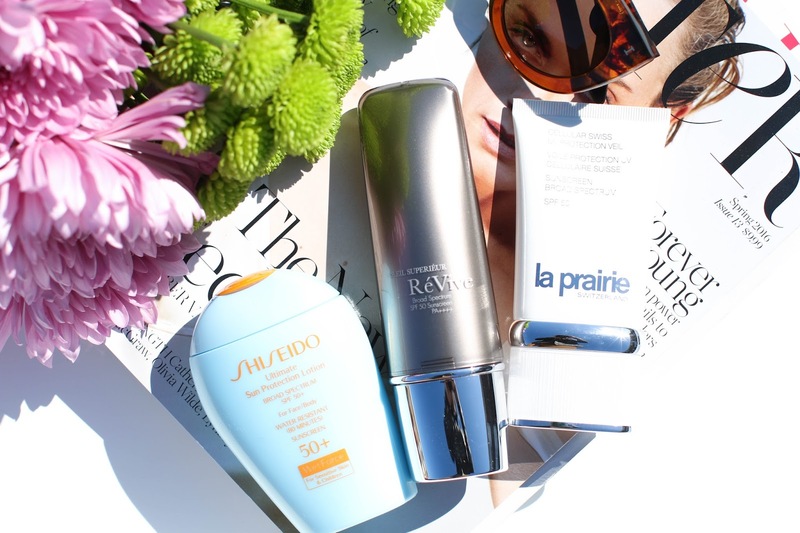 La Prairie Cellular Swiss UV Protection Veil Sunscreen Broad Spectrum SPF 50 - As with the Revive SPF, this one from La Prairie blends both anti-aging properties with traditional sun protection. There is a slight tint to this one that doesn't provide any coverage on my skin, but I find that it helps to even out any areas of redness on my face. In fact, I have been using this sunscreen alone on the weekends when I want to run a quick errand because it gives me the SPF I need while helping to slightly even out my skin tone. It leaves my skin with a natural matte finish and wears beautifully under makeup.